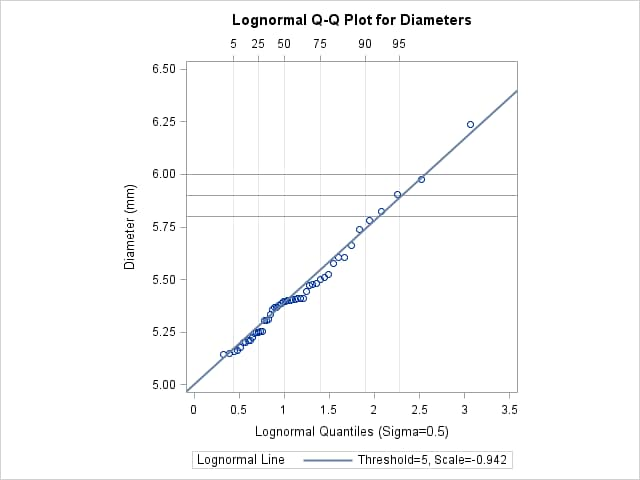 This example, which is a continuation of Example 4.31, shows how to use a Q-Q plot to estimate percentiles such as the 95th percentile of the lognormal distribution. A probability plot can also be used for this purpose, as illustrated in Example 4.26. The result is shown in Output 4.32.1. The PCTLAXIS option labels the major percentiles, and the GRID option draws percentile axis reference lines. The 95th percentile is 5.9, because the intersection of the distribution reference line and the 95th reference line occurs at this value on the vertical axis. A sample program for this example, uniex18.sas, is available in the SAS Sample Library for Base SAS software.